Here is my main ‘rack’ at home. Future CNC project likes extra slot in monitor switch. 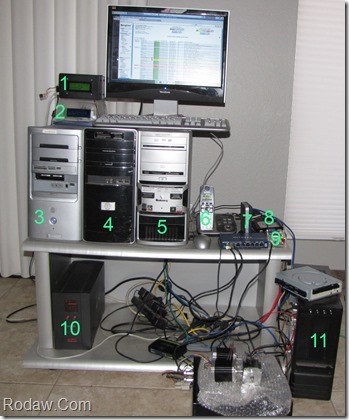 Note NEMA stepper motors. 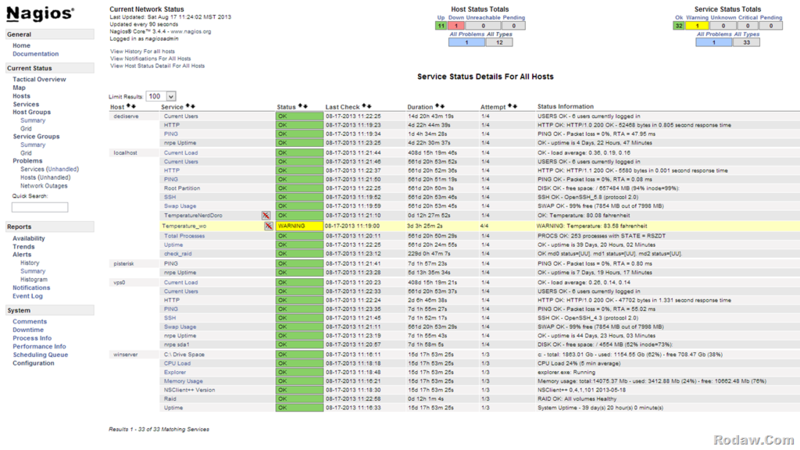 Display of Nagios monitored services including temperature from two separate sensors shown in this status screen. (click image to enlarge) The yellow highlighted line indicating warning, and the line above are temperature readings. The boxes to the left of each with the diagonal red line indicate not to send alerts. Nagios provides me email updates like this one when my Asterisk PBX, pisterisk, went down. 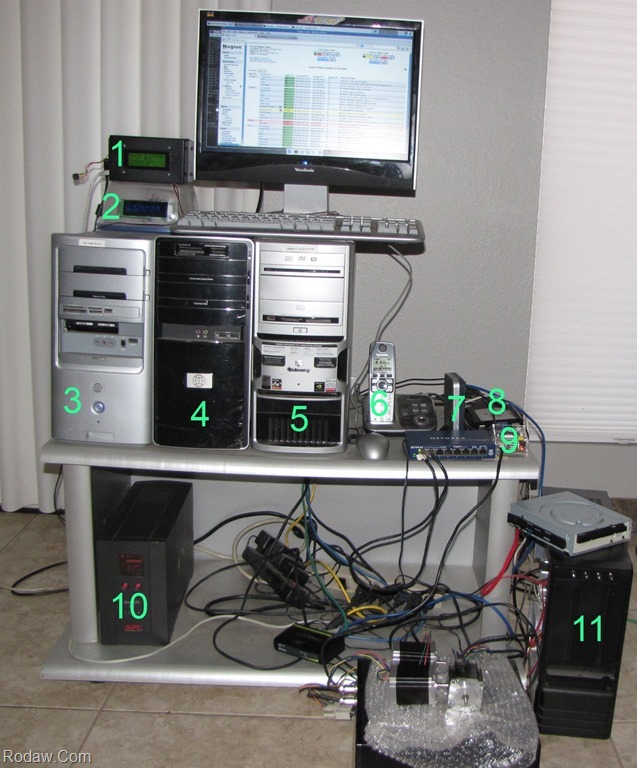 This article assumes you have a working Nagios system and have some familiarity with Nagios configuration. This blog post will explain how I monitor temperature with Nagios using a hardware sensor compatible with my HomeAmation MS Windows 8 and Windows Phone 8 projects. Previously I’ve published a couple projects that can deliver XML suitable for this Nagios plugin. A netduino temperature sensor can be found on gitHub as HomeAmationNetDuino and my Parallax Propeller project NerdDoro source is available on github as nerdDoro it produces similar XML in Propeller .spin. Given an XML file in this format my python Nagios plugin can be configure for normal, warning and alert states. # Prepare code for publishing. # one of the defined exit codes. 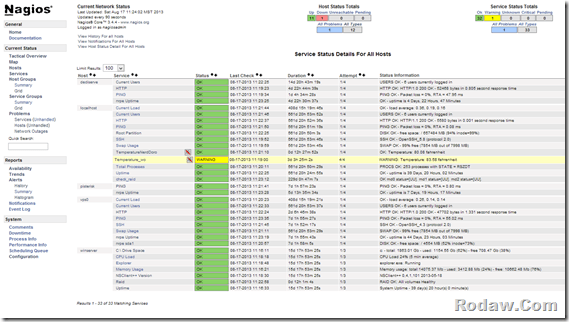 Critical level defaults to 95.0"""
And the Nagios Service. Note the warning and alert settings of 79 and 85. My nagios plugins are located on my ‘localhost’ host. That’s it. Plug them in to your Nagios system. Remember to change the url for your XML temperature source.